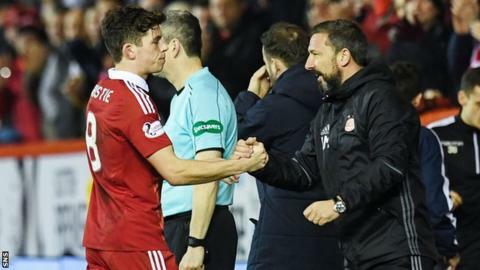 Ryan Christie says Derek McInnes' decision to stay at Aberdeen convinced him to agree another loan deal at Pittodrie. The Celtic midfielder spent the second half of last season on loan at the Dons, scoring seven goals in 15 games. But he admits to being unsure about a return until manager McInnes turned down the chance to join English Championship club Sunderland. "As soon as I heard that, my mind was made up to come back," Christie said. The 22-year-old was invited back to Aberdeen as part of the deal that took Jonny Hayes to Celtic for £1.3m. Sunderland's move for McInnes, to replace David Moyes, caused Christie a few moments of concern as he enjoyed his summer holiday. McInnes decided against a switch to Wearside to stay with the club he guided to second place in the Scottish Premiership and runners-up in both domestic cup competitions last term. That delighted Christie on a personal level and he also believes it was a significant moment for the whole of Scottish football. "It came out in the press that I would be coming back, but I was still on holiday lying on a beach," Christie told Red TV. "I hadn't had a phone call, so I didn't know what was going on. "When I came back, things had got into motion, but understandably I didn't want to make a decision until I knew the gaffer was staying. "When the news broke that he was going to stay, it was a shock to a lot of people in Scottish football, but it's brilliant news. "Not just for the club, as it is a huge lift, but also for the whole of Scottish football. "For a few years there it turned out to be that as soon as there was any offer from England, people would jump ship. So it's credit to the manager that he has stayed here. "He called me the next day to say he had made his mind up to stay at Aberdeen and wanted to have me on board."